Linear now estimate the carp stock in the water to be over 1,600. From photographs supplied to us we now believe there are over sixty fish in excess of 30lbs present, probably more. There are many more upper doubles and twenties in the water, all of which continue to grow. There are at least two different 40lb plus fish in the water, one a common at over 52lb. There are also large numbers of tench present which have been caught to over 11lb in the past along with a few big pike, perch, good roach and rudd. The 26 acre Oxlease Lake is situated off the B4449 as you approach the main ticket complex from Oxford just beyond the West Oxfordshire Sailing Club Lake; it is well sign-posted. Linear believes that with the stocking they have carried out the water now holds over 1,600 carp. We believe that there are now at least sixty, probably more, different 30 pound fish present along with a healthy number of twenties and doubles. The new lake record for a mirror carp is 45.04 and for a common it is 52.14. Oxlease could potentially have more thirties and forties present than St. Johns and Manor combined in a few years time! Pike to over 22 pounds and tench to over 11 pounds have been recorded caught and can provide superb sport on this lovely water. Please remember that the Oxlease gate will be locked for security reasons at night. 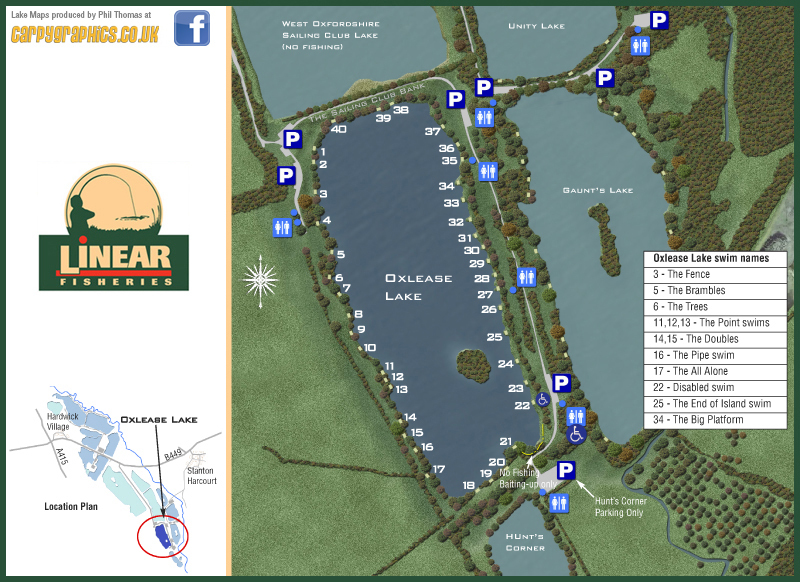 If you arrive after it is locked you must park in the early arrival car park by Hardwick Lake until we open at 8am. You must not block the gate or park alongside the track leading past Newlands Angling Club - if you do so you may be asked to leave the fishery.